During the zombie apocalypse, good footwear is a must. This is true whether you plan on being a zombie or surviving them! Zombies Playground is your one stop shop for all things zombie, and with that in mind, we offer a wide array of great shoes for both men and women that have zombies as their themes. We offer alternative footwear here suited to a zombies style. These allow guys and girls to sport some awesome undead appeal and style at casual or formal occasions. After all, nothing turns heads and catches eyes quite like a lady in heels spattered in crimson or wrapped in bullets! If you are looking to sport some unique zombie style, you have come to the right place, because Zombies Playground offers shoes for men and women that suit both of those needs perfectly. With decorative stitching and frayed saddle embellishment, these augmented oxfords will make you the most stylish beast on the block! 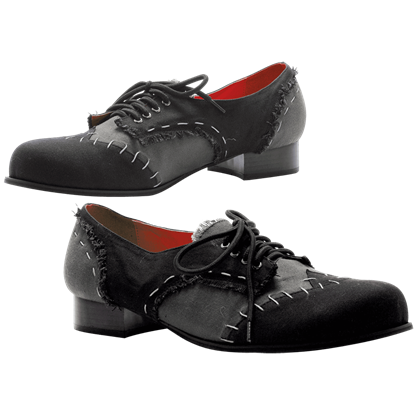 Wear these Frankie Zombie Saddle Shoes to a Monster Mash, a Ghoulish Gala, or any Swinging Soiree. Feeling frazzled by the costume footwear options? These Muerta Zombie Heels are just the ticket for your Undead ensemble. With decorative stitch detail and frayed edging, these heels will reanimate your monster party outfit. 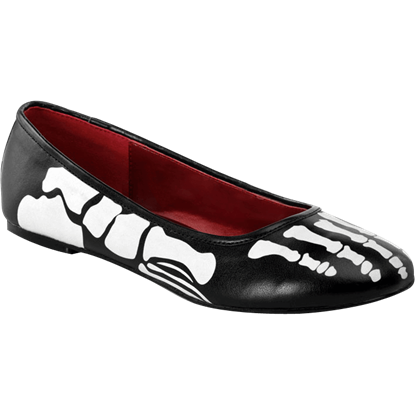 For a spooky look that you are sure to love, be sure to check out the X-Ray Ballet Flats for your next ensemble! These Gothic shoes display a white print of the foot bones of a skeleton over the black synthetic leather. 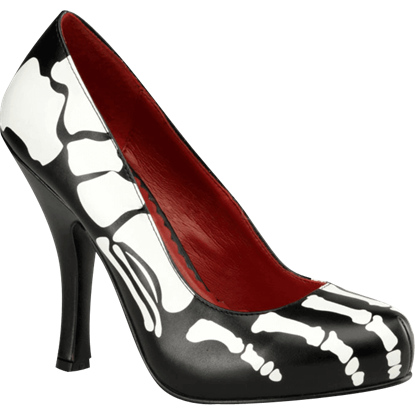 For a spooky look that you are sure to love, be sure to check out the X-Ray Pumps for your next ensemble! These Gothic shoes display a white print of the foot bones of a skeleton over the black vegan leather. For a spooky look that you are sure to love, be sure to check out the X-Ray Stiletto Boots for your next ensemble! These Gothic boots display a white print of the foot and leg bones of a skeleton over the black faux leather.